Thank you for being a Premium Seating Member with the United Center, Chicago Bulls and Chicago Blackhawks! We're very fortunate to have the best fans in the NBA and NHL! We're always looking for ways to improve your game-day experience. In the past, you've received booklets of tickets in the mail, which were used to enter the United Center for Bulls and Blackhawks games. Beginning with the coming 2016-17 season, traditional tickets will no longer be printed and mailed, and we're excited to introduce free, all-digital and convenient access to your Bulls and Blackhawks suite tickets through Unitedcenter.com/ClickTix and the United Center Mobile app. 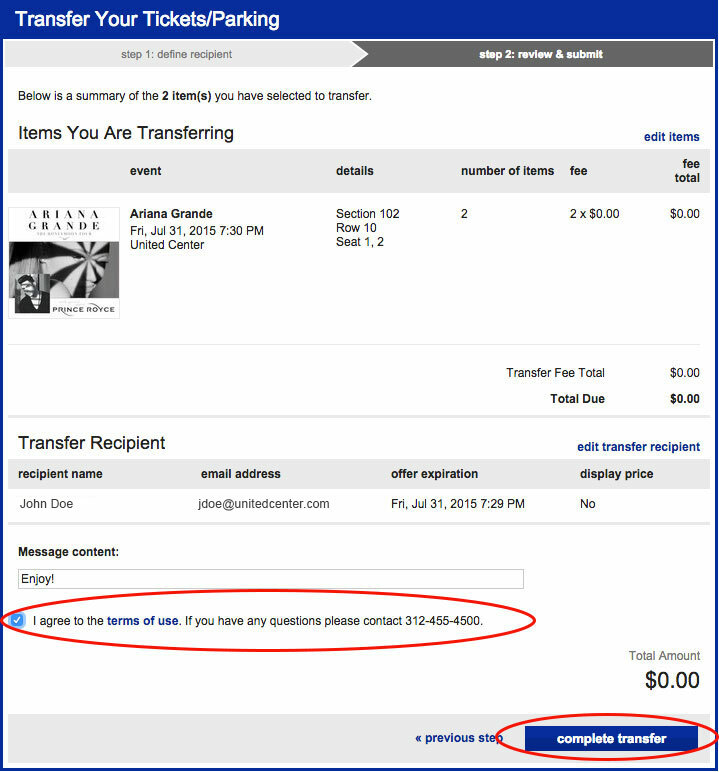 Convenient online ticket management to print your tickets or forward them by email. 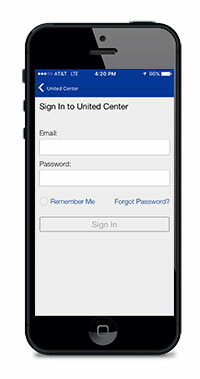 Quick and easy mobile entry into the United Center using a smart phone. Improved control and distribution when sharing your tickets. 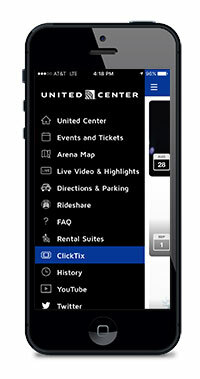 For the fastest mobile entry using a smart phone, after accessing your tickets on the United Center Mobile App or UnitedCenter.com/ClickTix, select "Add to Passbook" prior to arriving at the United Center. This bypasses the need for Wi-Fi or cellular data at the gates. And have your smart phone tickets open and ready for scanning while in line. Any tickets in the form of a .pdf cannot be scanned on your smart phone at the gates—any tickets in a .pdf must be printed on paper in advance for entry. If entering with guests using a smart phone, choose "select all" when viewing your tickets and swipe to navigate between them. 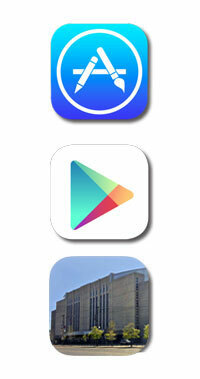 Download the United Center Mobile App, which is available for any iPhone or Android device. Locate the drop down menu and click on 'ClickTix'. From there, log-in using your Account ID and password, and then start managing your suite tickets. 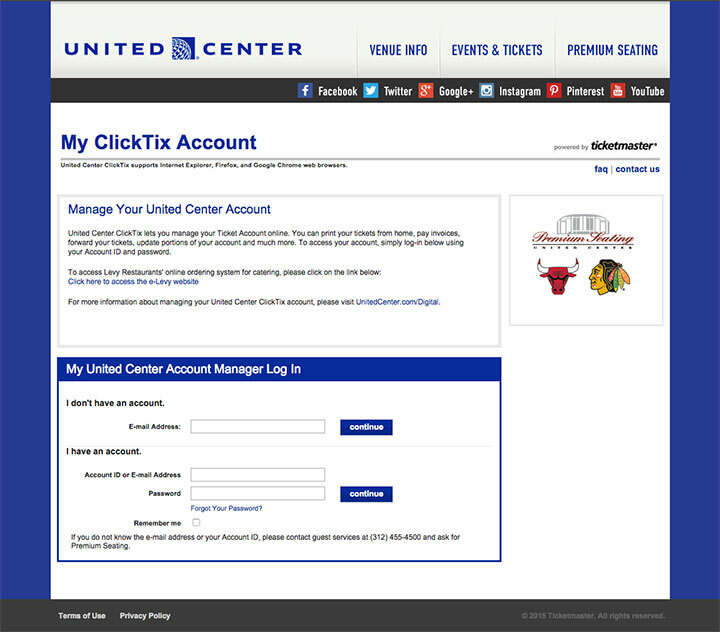 From any smart phone or computer, go directly to UnitedCenter.com/ClickTix. From there, simply log-in using your Account ID (or email address) and password, and then start managing your tickets. If you’ve previously used your United Center ClickTix account to email or print tickets at home, there is no need to set up a new account. Please login using your email address or Account ID as you’ve done in the past to explore the new features available to you. 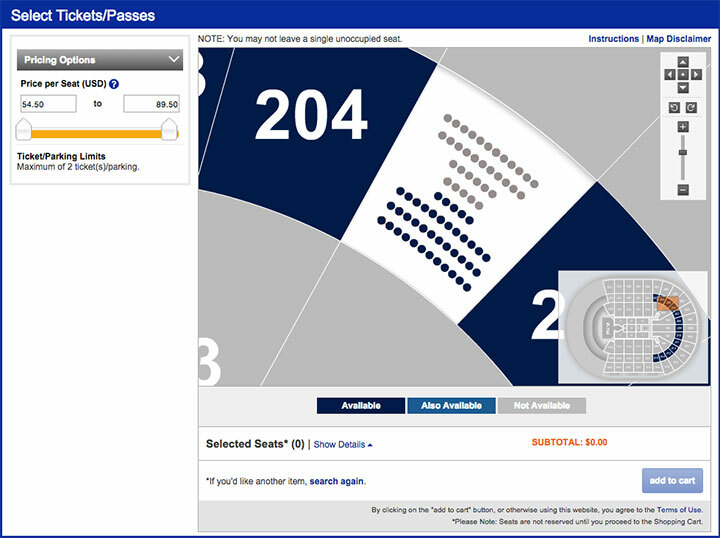 Once logged into your account, click on the “BUY PREMIUM SEATING” button under Special Events Available for Purchase! To purchase up to 8 additional suite tickets for Bulls or Blackhawks games, go to "Manage My Tickets/Parking." 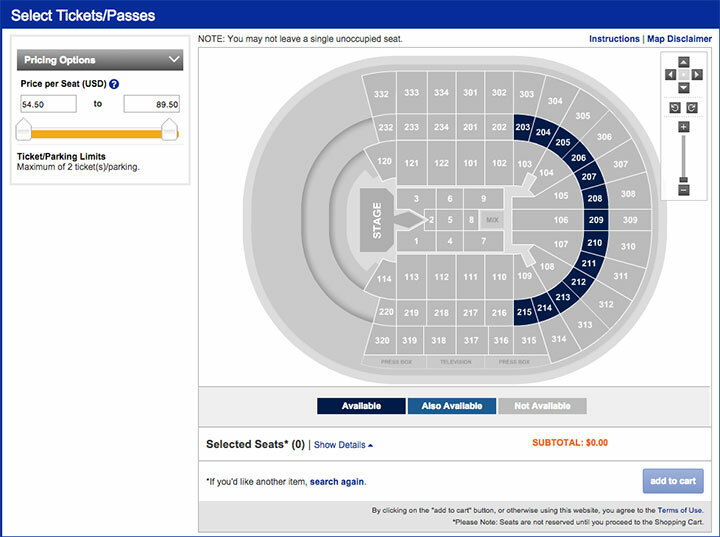 Please select a section and choose the specific seats you would like to purchase. Once you’ve clicked on the desired seats, click “add to cart." 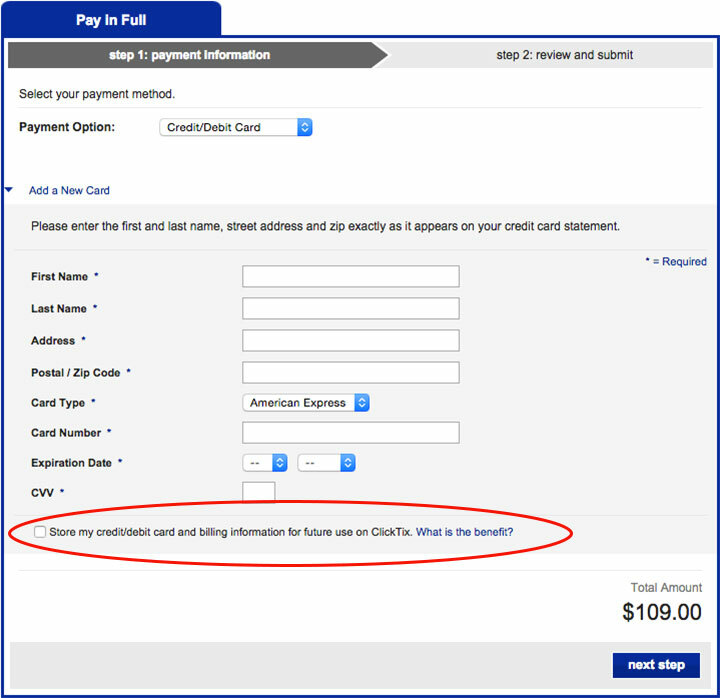 Select payment option “Credit/Debit Card.” You will be asked to enter all of the information associated with the card you would like to use and be able to store this card to your account for future purchases. You can review and then submit your order. Note about complimentary parking passes for Executive Suites: The two complimentary parking passes that accompany your first ticket order for a special event will not immediately appear in your ClickTix account once an order is placed. Please allow 24 hours for those passes to appear in your account. Download the Official United Center Mobile App, which is available on the App Store for iPhone or the Play Store for any Android device. Locate the dropdown menu (button on the top left of the screen). Select "ClickTix"
Log-in to ClickTix using your Account ID (or email address) and password, and then start managing your season tickets. Present your smart phone to the Guest Service Representative and have the bar code scanned. If you have guests and multiple tickets on your smart phone, simply swipe to navigate between them. After the bar codes are scanned, you'll receive a seat locator stub for each scanned ticket. Please note that iPhone users can conveniently add tickets to Apple Wallet app. If smartphone entry is not an option, you can also print out your tickets in advance from ClickTix to any printer. However, please note that printers are not available at the United Center's gates. You can print your tickets in advance directly from ClickTix to any printer. However, please note that printers will not be available at the United Center’s gates. 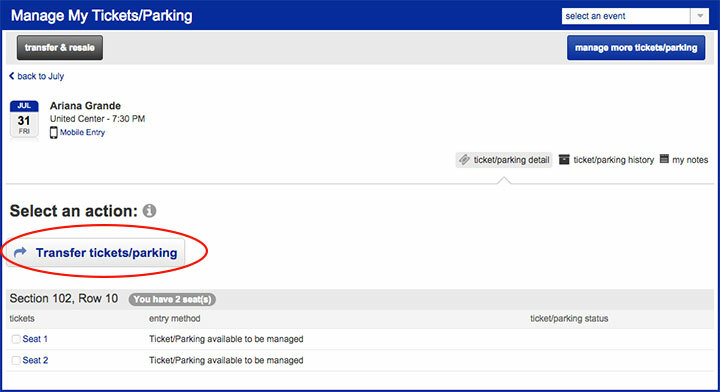 Once logged into your account, click the “manage my tickets” button on the right. VERY IMPORTANT: Do not print your tickets more than one time. If you print your tickets a second time, it will invalidate the first printing and only the second printing will be valid. 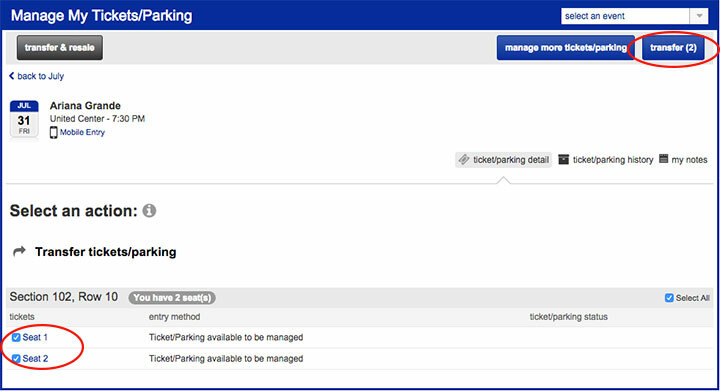 Click “Transfer tickets/parking” button and select the seats you wish to forward. Then click the blue “transfer” button in the upper right corner. Enter the forwarding email address and click the “add” button. Information you enter here will be saved for future use. Select your recipient, and if you want, add a message. 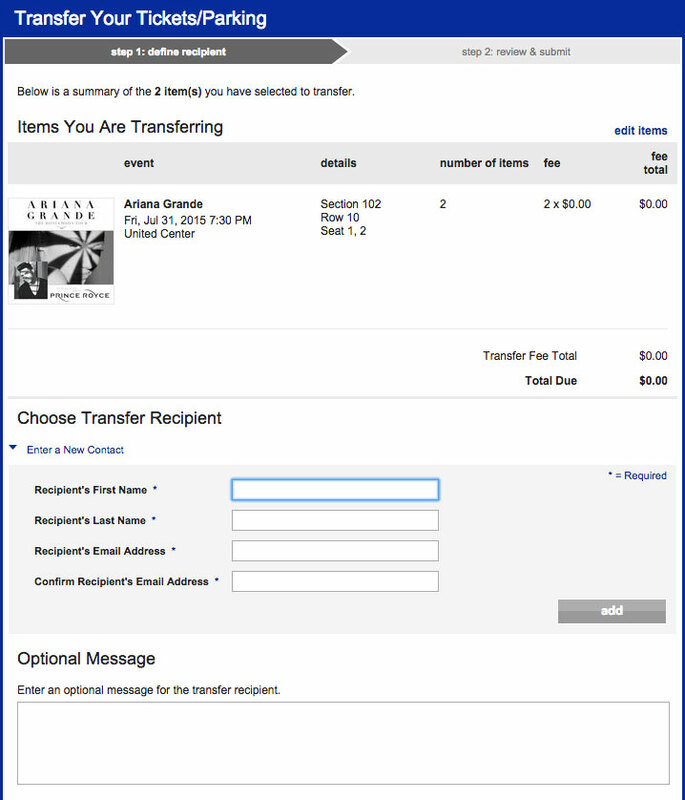 The recipient can then print the newly generated tickets from any printer.